MCC offers wireless DAQ solutions to fit a variety of applications. The WiFi-502 is 802.11b compliant and records temperature and humidity. It has an on screen data display while also saving data directly to a PC. 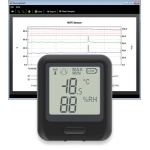 The BTH-1208LS offers short-range wireless data acquisition to a compatible host device – whether a Windows®-based PC or an Android™-based tablet, phone, or mini-PC. The WiFi-501-TP sensor measures the temperature of the environment in which the probe is situated. Data is transmitted wirelessly via a WiFi network to a PC and viewed using a free software package. During configuration the sensor will search for an existing wireless network while physically connected to the PC. It can then be placed anywhere within range of the network. The WLS Series are eight channel temperature measurement devices capable of measuring thermocouples, RTDs, thermistors, or semiconductor temperature devices. These remote devices can be located up to 150 feet (50 meters) indoors, or up to one half mile (750 m) outdoors from the PC. Easy to use software and drivers are included.